No, wait, there are tons of good reasons for putting a flashlight there. Like... huh. "Okay honey, the Home Colposcopy Kit is all set up! Oh, and you might want to bring a chair!" It illuminates the cobwebs as ART. isn't that just a piece of pvc plumbing pipe? I thought it was a microphone. Shower karaoke rules! Is it just me or is that... levitating? It looks like it's just hanging there my magic. Is that a self-levitating flashlight? My brain hurts. You need it to see while washing all of those nooks and crannies! What is hold that thing up - looks like it's floating in mid air. 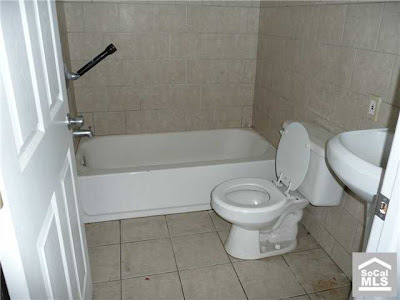 Maybe it's really dark in that bathroom? But it looks like it's stuck over the faucet handle, meaning the bottom (and presumably batteries) has been removed. Maybe the handle is really hard to turn and they needed extra leverage? I can see how it could look photoshopped or that it was levitating. I'm guessing that they've taken the batteries out and have it set over the temperature control knob. Maybe it's broken and they need the leverage. Who knows. Back alley colonoscopy clinic for the uninsured? No..nononono! The flashlight is there, pointing at the ceiling because they're installing new lights. Look at the shadows, especially from the door frame. See it? There is no light coming from above. The only light in the room is from the camera flash.